Enjoying the full-on cinema experience at home isn’t as expensive as it used to be – and that’s due in part to products like this: the BenQ new W703D DLP projector. Capable of splashing 720p HD images up to 7.62m diagonally on your wall (or projector screen), it’s perfect for big nights in – especially when you allow for the fact that you can use it to watch 3D Blu-ray movies, with a little help from some optional 3D glasses. Not bad for less than £500. 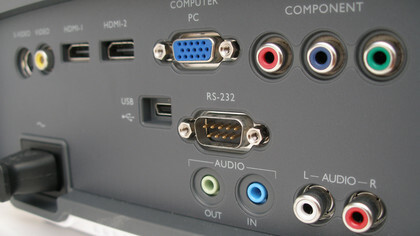 The BenQ W703D is certainly great value for money: its gloss white and grey plastic design feels high quality and there are plenty of connection options around the back for all your gear, including two HDMI ports; component, S-video and composite video inputs; mini USB and RS232 ports; and a set of audio inputs and outputs. The BenQ W703D also includes a built-in 10W speaker, which just about goes loud enough that you don’t need to hook up your home cinema system all the time to enjoy watching a movie – although it can distort if pushed too hard. 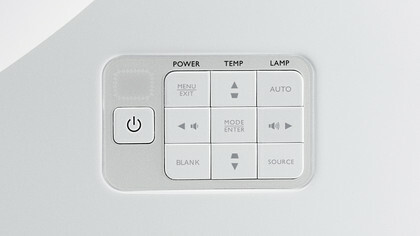 You also get a backlit remote control – handy for controlling the projector in the dark – as part of the package as well as a carry bag, power cable, VGA cable and CD manual. 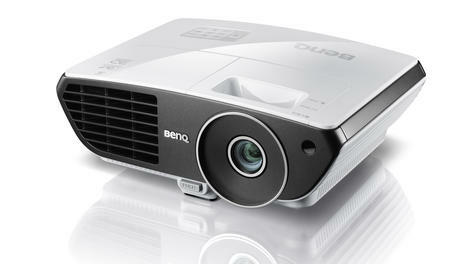 When it comes specs, the BenQ W703D has some headline grabbing numbers too, including 2,200 ANSI lumens brightness, which should ensure the projector works well in low ambient light, a 10,000:1 contrast ratio and support for 1.07 billion colours. Dig into the BenQ W703D’s menu system and you’ll also find plenty of other options to tweak its performance with various presets for viewing different kinds of content – Bright, Living Room, Gaming, Cinema, etc – while also giving you the option to create your own. There’s even an option to help you cope with different coloured walls: clearly not everyone who buys this projector is going to rush out and buy a dedicated projector screen, so this option makes it easy to move the projector around the house, knowing that it can cope with light yellow, pink, green or blue walls without affecting the fidelity of the colours you see on-screen. The most curious aspect of the W703D’s spec though its 3D capability. Although some videophiles would probably prefer it if the projector deliver 1080p Full HD resolution instead, we can vouch for the fact it’s there, it works (after a fashion) and that gives you a whole new range of 3D movie viewing and gaming possibilities at what’s the cheap end of the home cinema projector market. The only catch is that you don’t get any 3D glasses thrown in and branded ones from BenQ cost around £100 each online. Ouch. Getting the BenQ W703D up and running is certainly easy to do, thanks to a decent range of controls on the top of the projector itself; and on the remote – both of which make navigating its on-screen menu system fairly straightforward. The focus and fine focus controls are, perhaps, set a little too deep in the projector body for super-easy access, but we had no problems getting the focus set exactly right. The BenQ W703D certainly lives up to its billing when it comes to its HD performance. Although it doesn’t do 1080p, the 720p images it does deliver are still a rich, rewarding feast for the eyes – largely thanks to the projector’s 10,000:1 contrast ratio. This not only helps the BenQ W703D deliver surprisingly good black levels for a projector of its price, but also helps its 1.07 billion-colour palette be delivered more accurately. Indeed, the only time you’re really likely notice anything awry is in fast moving scenes where the action can sometimes appear to blur and / or stutter. We also caught occasional glimpses of DLP’s dreaded ‘rainbow effect’ – a feature that’s common on single-chip projectors like this one. The only other place the BenQ W703D really falls down is with its 3D performance, which not only makes some movie scenes look too dark, but also compounds the problem of blurring in fast-action movies scenes – making upgrading to the optional 3D glasses moot. 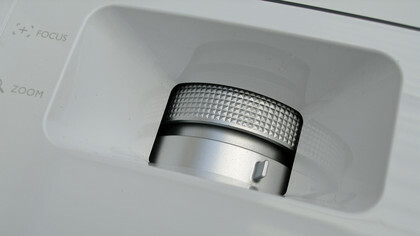 You may also be surprised by the amount of light leaking from the front and sides of the projector. It doesn’t seem to affect the W703D’s performance too much, but it can be a little distracting. There’s a lot to love about the BenQ W703D. it’s HD performance is remarkable for a sub-£500 projector, despite the fact that it doesn’t do 1080p Full HD and it’s easy to setup and use – making it ideal those of us who want to turn a night in front of the TV into something a little more special. The biggest letdown, really, is its performance with 3D content, but when you’re looking at something as afffordable as this, you can’t really have everything, can you?